In general, the API implements a simple request-response protocol. The computer sends a request to the device and the device sends back a response. The response can be a simple Success message, a Failure message, or an answer to the request giving the requested data. Moreover, the response can be a request from the device to the computer, e.g., for entering the PIN, the passphrase or giving some other information. In that case the computer should send the corresponding Ack packet to answer the request and wait for another response. As first message, the computer should send an empty Initialize packet and expect a Features packet as response. The Initialize packet will cause the device to stop what it is currently doing and should work at any time. Thus, it can also be used to recover from previous errors. If the device requires the user to press a button, it will reply with a ButtonRequest to the computer. The computer should immediately send a ButtonAck acknowledging the request. But it should also display an indication to the user that it should follow the instruction on the device. The field code in the ButtonRequest message explains what type of request the user should acknowledge with a button. If the user never presses the button, there will never be a reply to the ButtonAck message. The computer can use Cancel to abort the current operation. This should result in a Failure response. If the device requires the user to unlock the device with a PIN, it will reply with a PinMatrixRequest. The field type gives some explanation what PIN is required (current pin, new pin, or confirmation of new pin). The computer should display an empty pin matrix and let the user enter the pin. The computer should encode the PIN as if the numbers are ordered like they are on the numeric keypad. The encoded PIN should then be send with a PinMatrixAck message. If the device requires the user to enter the passphrase, it will reply with a PassphraseRequest. The computer should ask the user for the passphrase and send it in clear text with a PassphraseAck message. If show_display is set the address is displayed to the user. In any case, it is also sent to the computer with an Address response. The message GetPublicKey can be used to get a bip-32 master public key from the trezor or to display it to the user. 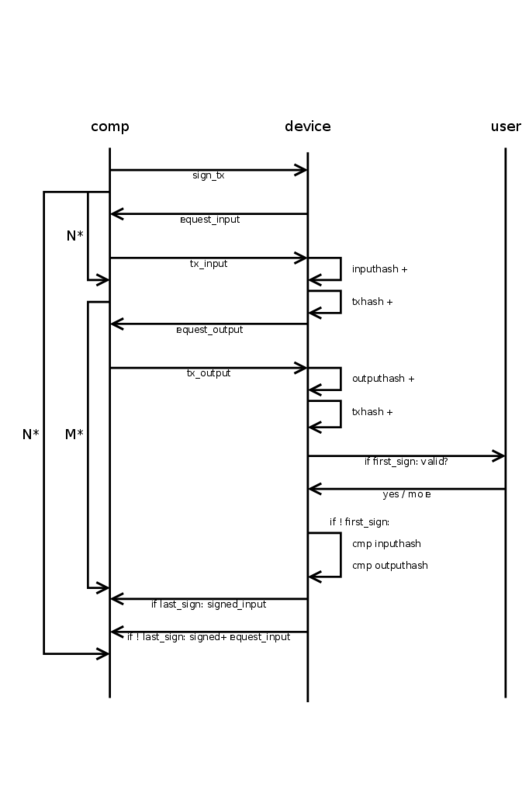 The field address_n gives the bip-32 path to the master key. The field ecdsa_curve_name can be used to get Ed25519 or NIST256P1 public keys. The computer starts the transaction signing process by sending a SignTx message. From then on, the device drives all further communications by sending requests to the computer until it finally sends a TxRequest with request set to TXFINISHED. This final message should not be acknowledged by the computer. The SignTx message contains only the meta data of the transaction that should be signed, i.e., the number of inputs and outputs, the coin name, the version number, and lock_time (only for pre-signed time locked transactions). If the device was not unlocked before, it will respond with the usual PinMatrixRequest and PasswordRequest messages to authenticate the user. See the corresponding sections above. It may also send a ButtonRequest at any time to indicate that the user should confirm a transaction output or the total fee. Then the main process begins and Trezor will respond with TxRequest messages, which should be answered by TxAck message. A TxRequest message has up to three parts. Parts of the signed transactions. A signature for one of the inputs. A request for one piece of the new transaction or a previous transaction. If the field serialized.serialized_tx is set, it contains a chunk of the signed transaction in serialized format. The chunks are returned in the right order and just concatenating all returned chunks will result in the signed transaction. If the field serialized.signature is set, it contains a signature for one of the inputs. The signatures are returned in the same order as they appear in the serialized transactions. I.e., the non-segwit signatures come before the segwit signatures, since the latter are part of the witness, which is serialized at the end. Apart from that, the signatures are returned in the order the inputs appear in the transaction. The signatures are not really needed, as they are already in the serialized transaction. They can be useful for combining multisig signatures without having to parse the transactions again. If the field request equals TXFINISHED, this message contained the last chunk of the transaction. The signing is finished and the computer must not reply to this packet. In any other case, the device requested some piece of some transaction, which is specified by request and details. This request must be answered by a TxAck package containing the requested piece of data. If the field details.tx_hash is not set, some piece of the transaction that should be signed is requested. Otherwise, this field contains the hash of some input transaction and some piece of that transaction is requested. For request = TXMETA, the fields tx.version, tx.lock_time, tx.inputs_cnt (number of inputs), and tx.outputs_cnt must be filled. For ZCash transactions also tx.extra_data_len must be given. This will only be requested for input transactions (for the signed transaction it was given in the SignTx call). For request = TXINPUT, the field details.request_index contains the number of the input requested (starting with zero). The reply must fill the structure tx.inputs (there must be exactly one input in the reply). Which fields must be set depends on whether details.tx_hash is set (an input of some previous transaction is requested, that is spend in the new transaction), or whether an input of the new transaction is requested. In both cases prev_hash, prev_index and sequence must be set. For a previous transaction, the script_sig must be set to the raw signature data. Note, that for segwit script_type does not distinguish between multisig or p2wpkh addresses. Instead the presence of the multisig decides this. For segwit inputs also the amount field must be set to the amount of satoshis in the input transaction. For request = TXOUTPUT, the field details.request_index contains the number of the output requested (starting with zero). If details.tx_hash is set, this is an output of a previous transaction and the tx.bin_outputs field must be filled in the TxAck reply. Otherwise, the tx.outputs field must be filled. For change outputs, the field address_n must be filled and address must be omitted. If the change is multisig, the multisig must be filled and it must use the same extended public keys as all inputs. For a change address, the script_type should be PAYTOADDRESS, PAYTOMULTISIG, PAYTOWITNESS or PAYTOP2SHWITNESS matching the corresponding cases SPEND... for inputs. For OP_RETURN outputs, set script_type = PAYTOOPRETURN and set the op_return_data field. Otherwise address should be set to a base58 encoded address and script_type to PAYTOADDRESS. Older firmware required script_type = PAYTOSCRIPTHASH for p2sh addresses, though (and newer firmware still support this). Verify message asks device to verify if the signature is a signed message with the given address. The arguments of the message are signature, message being verified, address and coin which should be used for verifying. Cipher key value provides symmetric encryption in the Trezor device, where the key doesn't exit the device, and where the user might be forced to confirm the encryption/decryption on the display. The data sent to the device are The following data are BIP-32 derivation path, key (that is being shown on the device), value, encrypt/decrypt direction, should user confirm on encrypt?, should user confirm on decrypt? and optional IV. Value is what is actually being encrypted. The key for the encryption is constructed from the private key on the BIP address, the key displayed on the device, and the two informations about whether to ask for confirmation. It is constructed in such a way, that different path, key or the confirm information will get a different encryption key and IV. So, you cannot "skip" the confirmation by using different input. IV can be either manually set, or it is computed together with the key. The value must be divisible into 16-byte blocks. The application has to pad the blocks itself and ensure safety; for example, by using PKCS7. See https://github.com/satoshilabs/slips/blob/master/slip-0011.md. Reset device message performs Trezor device setup and generates new wallet with new recovery seed. The device must be in unitialized state, the firmware is already installed but it has not been initialized yet. If it is initialized and the user wants to perform a reset device, the device must be wiped first. If the Trezor is prepared for its initialization the screen is showing "Go to trezor.io". The reset device can be done in Trezor Wallet interface (https://trezor.io/start) and also with Python trezorctl command (See Using trezorctl commands with Trezor). After sending message to the device, device warn us to never make a digital copy of your recovery seed and never upload it online, this message has to be confirmed by pressing on "I understand" on the device. After confirmed, the device produces internal entropy which is random of 32 bytes, requests external entropy which is produced in computer and computes mnemonic (recovery seed) using internal, external entropy and given strength (12, 18 or 24 words). Trezor Wallet interface doesn't provide option to choose how many words there should be in the generated mnemonic (recovery seed). It is hardcoded to 12 words for Trezor Model T but if done with python's trezorctl command it can be chosen (for initialization with python's trezorctl command, 24 words mnemonic is default). After showing mnemonic on the Trezor device, Trezor Model T requires 2 random words to be entered to the device to confirm the user has written down the mnemonic properly. If there are errors in entered words, the device shows the recovery seed again. If the backup check is successful, the setup is finished. If the Trezor Wallet interface is used, user is asked to set the label and pin (setting up the pin can be skipped) for the wallet, this is optional when using python trezorctl command. Recovery device lets user to recover BIP39 seed into empty Trezor device. First the device asks user for the number of words in recovered seed, the words are typed in one by one - on the device screen when using Trezor model T, with Trezor One the user can decide to do the advanced recovery (with entering seed using matrix similarly to entering PIN) or standard recovery (with entering the seed to the host computer one by one in random order). The process continues with optional check of the seed validity and optional setting up the PIN, which has to be confirmed. Finally the recovered wallet is saved into device storage. The same process is used with the dry run recovery, the differences are that this process can be done only with already initialized deviice and that the mnemonic is not saved into the device but it is only compared to the mnemonic already loaded into the device with the successful result (The seed is valid and matches the one in the device) or unsuccessful result(The seed is valid but does not match the one in the device). Load device lets user to load the device with the specific recovery seed. This command is the subset of the recovery device and it can not be done with Trezor Wallet interface, only with python command trezorctl. This message can be used only if the device is not initialized. Wipe device lets user wipe the device. It is possible to wipe only user's wallet or erase all the data from the Trezor device including installed firmware. Wiping device in Trezor Wallet interface wipes only user's wallet. It is also possible to wipe the firmware with python trezorctl command, Trezor device must be in bootloader mode. Apply settings lets user change settings on the Trezor device, mainly its homescreen, label and passphrase settings. Passphrase can be set to enabled or disabled. Furthermore it can be set that passphrase is entered solely on device or solely on host, by default the device always ask where the user wants to enter the passphrase. All these settings have to be confirmed by user on the device. This message lets user change, remove or set new PIN. First the user is asked to enter old PIN if it was set before. The user is then asked to enter new PIN and re-enter it to confirm match. It is also possible to not enter new PIN, so the Change PIN message will just remove the old one. The action has to be confirmed by user. This page was last edited on 7 December 2018, at 14:15.